I think all cooks have their own version of this baked chicken and rice recipe. Some people use cream soups, some use broth, but they all call for baking chicken and rice together in the oven. This is our version (my favorite part is the rice). I usually put in tons more chicken than the recipe calls for, because it is a "freebie" way of making sandwich fixings (not to mention, chicken cooked this way has a wonderful flavor). Brown the chicken breasts in a couple tablespoons of butter then set them aside. In the same pan that you browned the chicken in, saute the onion and celery until tender, then stir in the raw rice (you stir in the rice so that it will get coated with butter and not stick together while baking). Once the rice has sauteed for a minute or so, add the soup, stock, chicken bullion and spices. Whisk until smooth. Pour this mixture into a greased 9 x 13 baking dish and stir to distribute the rice evenly. 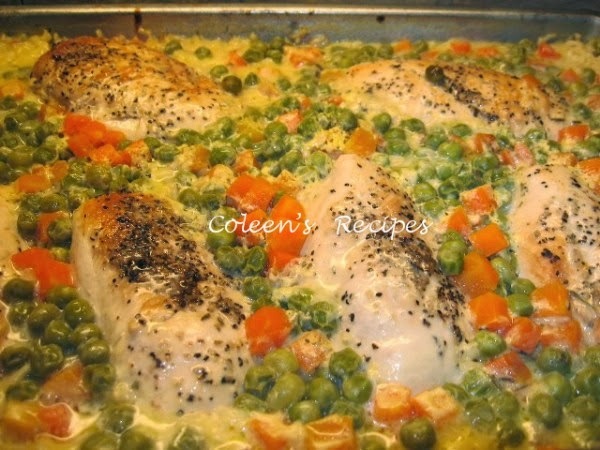 Set the browned chicken on top of the rice (push it down into the liquid a little) and top the whole casserole with frozen peas and carrots. 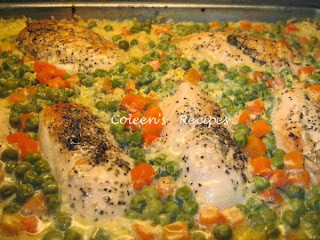 Cover tightly and bake at 325F for 1½ hours (if the chicken breasts are large). NOTE: I don't buy poultry seasoning because I use it so seldom and it goes to waste. Instead, I use equal parts of dry rosemary, rubbed sage leaf and thyme leaves and a pinch of marjoram. I grind these together then measure ¾ teaspoon. I love this stuff! I'm a fan of the rice too...looks so yummy. This looks and sounds fantastic! I love rice cooked with chicken and this recipe is a keeper! Thanks! Love the sound of this! Definately more dressed up than the version I ate growing up. YUM! I haven't made this in years. 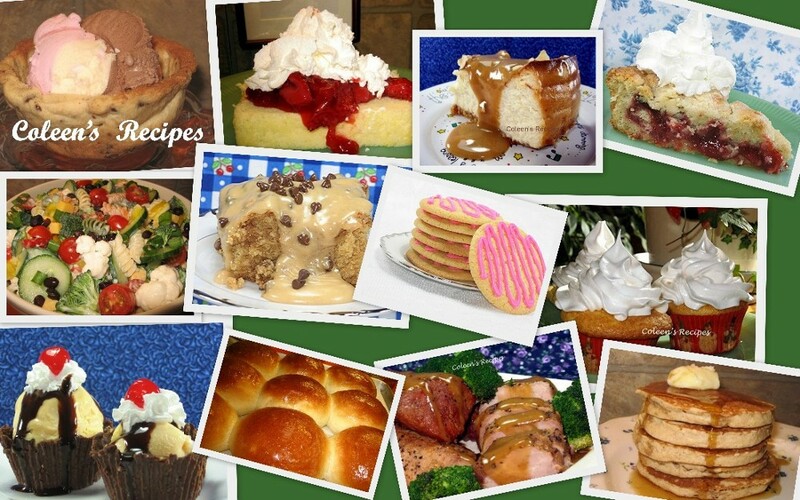 Back then I had to scale the recipe up, now I have to scale it down :-). Yours looks wonderful. I hope you're having a great day, Colleen. This looks so good! 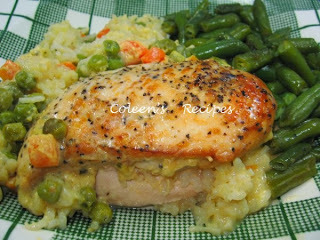 I am a big fan of chicken and rice together and can't wait to try this! Looks delicious Coleen. We all love chicken and rice here. I'll have to try your version. I made your banana bread and it was delicious. I'll probably post it later this week or next. Thanks! looks like the perfect dinner! Good ol' chicken and rice! This looks delicious. Gotta love the classics. Ole Sweetie-Pi won't eat rice, but would eat the chicken, made like this. Heck, I'd eat all the rice and the chicken, too! Haven't made this in AGES, but it is soooo doggone good that I must add it back to rotation. LOL, from the sounds of it I may be one of the few people who hasn't made this or some variation of it. It does look good Coleen. Definitely a dish my kiddos would enjoy. This looks yummy and I agree with the poultry seasoning, besides I'm not fond of the taste of poultry season. I love chicken bakes! ...especially with rice! Unfortunately, I would have to leave the peas out for my non-pea eating boys but I think it looks yummy just like it is! Coleen, this looks just wonderful. I have already bookmarked it to try. I am always looking for Something Easy to do with the split chicken breasts that I find on sale. This looks like a definite keeper! Thanks so much for sharing. I did NOT have a recipe for this and I know my son will enjoy it so much.